Born in Puerto Rico, raised from the age of 5 in Spanish Harlem, New York City, graduated at 17 from high school. Married Manuel Susarret at 18. Two weeks later husband inducted into the U.S. Army. As an Army wife, she went to Camp Chaffee, Arkansas, then to Fort Smith, California. Edith was blessed with 6 children before being widowed at 35 years of age in 1958. No time for weeping. At night she sketched her precious children on brown paper bags while they slept. She taught herself to draw. Her children, Edith -16, Manuel-12, Ruth and Delia (twins)-10, David-4 and Shirley (Chola)-3, were so proud of their pictures; they took them to school to show their teachers and friends. The teachers were so impressed with the drawings; they presented them to their principal, who took it up with the art department. She was awarded a 2-year scholarship at one of the most prestigious art schools in the country- Pratt Institute. After graduating with honors on the Dean’s list in June 1977, she continued her art studies at Art Students League. Her children grown, and living on their own, the artist moved to Cincinnati to be closer to her oldest son, Manuel, and her youngest daughter, Chola. Ms. Marrero paints daily, studies classical guitar, sings in the St. John’s Unitarian-Universalist Church choir with Dr. Cathy Rom and exhibits her work at her Roanoke apartment-studio in Clifton. 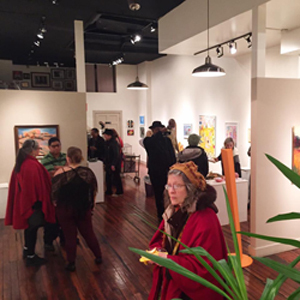 She also takes classes and has exhibited her work with Art Beyond Boundaries, Cincinnati Art Club, Cincinnati Women’s Art Club, Essex Studios, Fairfield Arts Center, St. John’s and Hyde Park Square Art Show (twice).